Timmerman On "The Truth About What Happened in Benghazi"
Kenneth Timmerman has reported from the Middle East for 35 years. He was one of the first journalists on the scene after Iranian terrorists bombed the U.S. Embassy in Beirut, Lebanon in 1983. When the 2012 attack on the U.S. Embassy in Benghazi left four Americans dead, Timmerman recognized the pathetically inadequate coverage. Timmerman utilized his contacts from the Middle East and his knowledge from time spent reporting on the ground in the countries to write “Dark Forces: The Truth About What Happened in Benghazi.” Last week, Timmerman joined me for an exclusive interview. Q: You write in the book that the Benghazi attacks were a culmination of a shift in U.S. policy that was set in motion by President Obama. 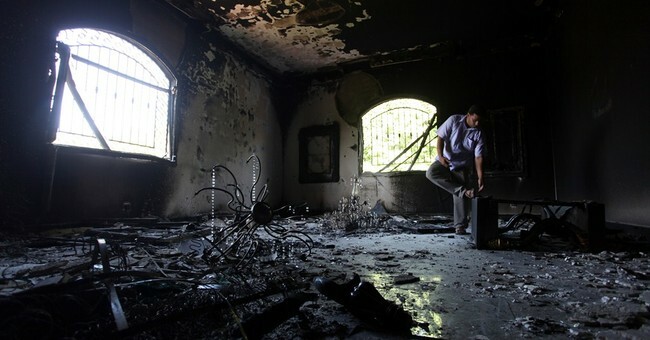 What were the key moving points that led up to what happened in Benghazi? Timmerman: The administration right in the beginning set off on a path to quote “improve relations with the muslim world.” This was an announced policy shift, it included also, an outreach toward the Islamic Republic of Iran. Obama claimed, inaccurately, that the Bush administration had no diplomatic contacts with the Iranians when, in fact, there had been 28 high-level meetings between Bush administration officials and the Iranian government that led to nothing. Obama came this new stated policy and put it into effect immediately. He goes to Istanbul in April, he invites the Muslim Brotherhood to Washington to the White House for secret meetings also in April of 2009. In June, shortly after his speech at Cairo University, the pro-freedom demonstrations erupted in Iran after their failed, or stolen presidential elections, and there were 3 million people in the streets of Iran holding up signs in English: “Obama are you with us?” and he showed, very quickly, that he was not, and he was on the side of a radical Islamist regime in Tehran, rather than the people of Iran. Fast-forward from there, to the ousting of Ben Ali in Tunisia, the ousting of Mubarak in Egypt, and ultimately the ousting of Gaddafi, and what you have is a systematic reversal of American policy. The shift goes to essentially enhance radical Islamist regimes around the world, or to create them, as happened in Egypt and later in Libya. And that, I think, is what led directly to the Benghazi attacks. It showed weakness, and in the Middle East and the Muslim world, where I’ve been reporting from for the past 35 years, weakness invites attack. Q: How did your knowledge of the Middle East add to the book? Timmerman: Many of the players I know personally; I’ve met them, I’ve interviewed them. I’ve been to most of the countries that I describe. I was in Libya, witnessing Gaddafi’s submission to the United States in 2004. We actually got his weapons of mass destruction loaded onto a ship in Tripoli Harbor while I was there in March of 2004; brought back to the United States, both the uranium enrichment centrifuges and his ballistic missiles. This was a tremendous victory for the Bush administration. Gaddafi also cut off his support for international terrorist organizations, and he truly did. He was an ally in the global War on Terrorism, he was cracking down on the al-Qaeda fronts in his country, and he was accepting Libyans that we had detained (either in Gitmo or Pakistan, or elsewhere) in his jails and treating them relatively humanely. And I can say that, because Chris Stevens was going into the jails to actually interview these prisons to make sure that they were not being tortured. Gaddafi had become a de facto ally in the war against global terrorism and what do we do in response? We throw him over, in exchange for the terrorists we were trying to fight. Q: Do you think Obama’s actions result from design or ignorance? Timmerman: This was a policy of conviction on the part of the president and his closest advisors. He believed, for whatever reason, that the United States was at fault. That the hostility towards the United States that led to the September 11, 2001 attack was America’s fault and that we had to correct the image that we presented around the world, by kowtowing to dictators, by kowtowing to Islamic fundamentalists, and by pretending that radical Islam was as acceptable as...um...I don’t know, democratic socialism in Europe. Q: You discuss how former White House press Secretary Jay Carney played a part in the cover-up, and even more recently he criticized the GOP for politicizing Benghazi. What is the proper response to that claim? I’ve notice that Jay Carney has since resigned, perhaps because telling lies on a daily basis just got too much for him. We only know the bare minimum of the facts, of what happened in Benghazi, that’s why I wrote this book. I am only one person. I did not have big think tank people behind me, I did not have any major news organization behind me. I did have 35 years of experience in the Middle East and a pretty large rolodex of contacts. I went to defectors for the Iranian terrorism organization, for example, to ask the fundamental question: “Was Iran engaged at all in Benghazi?” The information that came back was astonishing. That should have been accessible to other reporters and other researchers, as well as to the U.S. government. I found out, also through my contacts, about an absolutely astonishing arms smuggling operation out of Libya to radical jihadi groups around the world, that appears to have been authorized, or at the very least explicitly tolerated, by John Brennan, who at the time was the president’s counterterrorism advisor. That is in violation of so many U.S. statutes it’s hard to number them on my hands and my feet. Q: What would you like to see moving forward? Timmerman: It’s time to tell the truth. It’s time to get the facts out. It’s time for the American people to understand and be told, authoritatively, that what happened in Benghazi was a state-sponsored terrorist attack by the Islamic people of Iran. And it’s time for the U.S. government to stand up to that very uncomfortable truth and do something about it.